It’s November, 1982 and the sport of boxing is bigger than ever. Sugar Ray Leonard, Roberto Duran, Marvin Hagler and Thomas Hearns are all mainstream stars and fight fans enjoy championship matches on free cable TV almost every weekend. Rocky III is a huge hit in theaters and just a few months previous, one of the richest fights of all-time had taken place, Larry Holmes vs. Gerry Cooney. And standing right in the thick of things, not yet a boxing superstar but certainly one of the higher profile champions: Alexis Arguello. A regular on network television, the Nicaraguan is regarded as not only one of the best boxers on the planet, but an all-time great, only the seventh fighter in the long history of boxing to win three divisional world titles. And that’s what the big battle in Miami’s Orange Bowl was all about: to see if Arguello could make history and emerge as a true immortal, a sports superstar, by becoming the first boxer ever to win world titles in four different weight classes. Arguello’s chief threat was his powerful right. The man Arguello had to beat to get that fourth belt was not a household name, but everyone in the game knew Aaron “The Hawk” Pryor was one hell of a fighter. In contrast to popular champions like Leonard and Hearns, Pryor’s whole career had been a struggle for recognition. An outstanding amateur talent with over 200 wins, he dropped a close decision to Howard Davis Jr. in a critical match and so failed to make the team that won a boatload of medals at the ’76 Olympics. Without the fame a gold medal would have brought him, Pryor soon discovered the public was not particularly anxious to buy tickets to his fights. While some might have been discouraged by this, being the outsider was nothing new for Pryor. He had always been regarded as a misfit, despite the fact no one trained harder and no one fought with more ferocity. Relentless and unorthodox inside the ring, his character outside of it proved erratic and difficult. Once he turned pro, almost no one wanted to manage him and even fewer wanted to fight him. It was so bad he had to abandon the 135 pound weight class and climb up to the super-lightweights to get a title shot. After annihilating veteran champion Antonio Cervantes in four rounds, his hometown of Cincinnati held a parade for him that was literally one car long. The crowd in the Orange Bowl was treated to a war for the ages. In stark contrast to Pryor, Alexis Arguello was smooth and charming, both in and out of the ring. An elder statesman and something of a legend, his class and sportsmanship was as admired as his excellent ring technique and lethal power. Boasting a devastating right hand and 62 knockouts in 72 wins, Arguello had the respect and approval of almost everyone in boxing, while the bitter Pryor charmed no one. 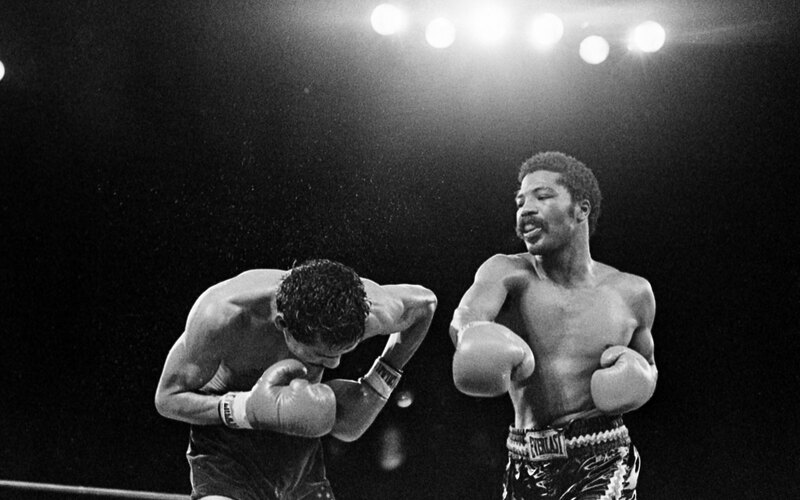 And unlike Arguello’s refined and studied ring craft, Pryor was wild and unpredictable, constantly darting, lunging, and throwing heavy punches from any position and any angle. 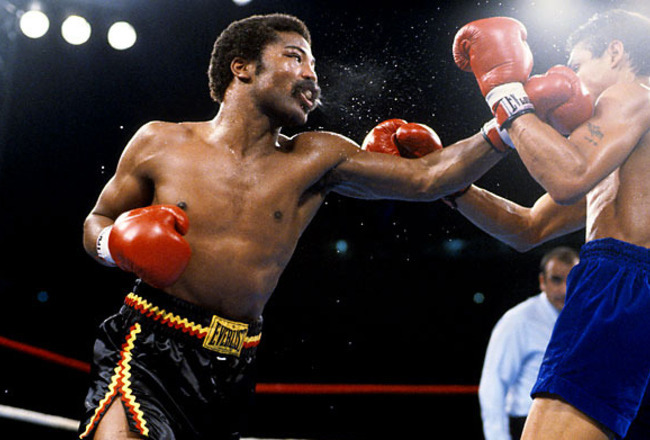 Against Arguello, few thought Pryor would win. More to the point, the public wanted Alexis to succeed and make history, and the stands at the cavernous Orange Bowl in Miami filled up with thousands of Latin-Americans eager to see their hero become a superstar. But the anti-Pryor crowd didn’t bother the champion in the least. People had been tearing Aaron down and telling him he’d never amount to much all his life and he had proven them all wrong. Now he understood that defeat to Arguello would mean being quickly cast aside so more popular boxers could get the big opportunities and the big money. If Arguello was fighting for history, Pryor had an equally potent motivation: to make himself matter. 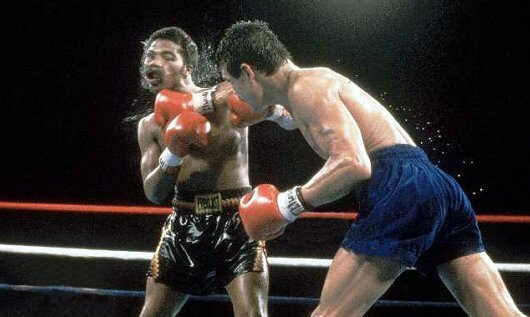 The intense and thrilling battle that took place that night has only grown in stature over the years; Pryor vs Arguello I is widely viewed as one of the greatest action fights of all time. And it was Pryor who made it a war. From the outset, “The Cincinnati Cyclone” charged at Arguello with one thing on his mind: knockout. The opening round shocked everyone as the champion immediately took Arguello out of his game plan and imposed a ferocious and fast-paced slugfest. 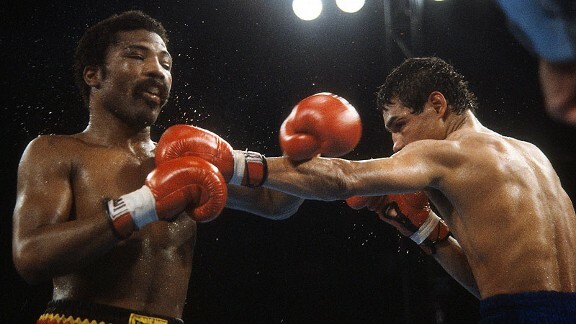 It was an opening round to rival that of Hagler vs Hearns, Pryor throwing an amazing 130 punches, the normally patient Arguello not far behind with 108. Thus the tone and pace of the contest were set; round after fast-paced round rushed by at breakneck speed as the two champions slugged it out. 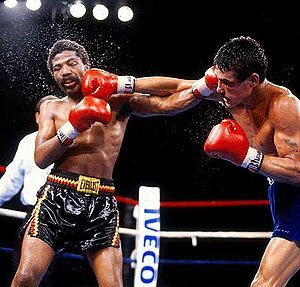 Pryor appeared to have the edge with his faster hands and relentless buzzsaw style, but Arguello’s fans never lost heart because they knew victory was just one clean right hand away. The only problem with this theory was that whenever Pryor got nailed, he just smiled and tore back in for more. Arguello regularly struck with flush overhand or straight rights that would have stunned a rhinoceros, but had little effect on the wild man from Ohio who just never stopped throwing punches. All were amazed at the sturdiness of Pryor’s chin. But even wild men are human, and as the bout entered the later rounds, Pryor’s kamikaze attack appeared to wind down. 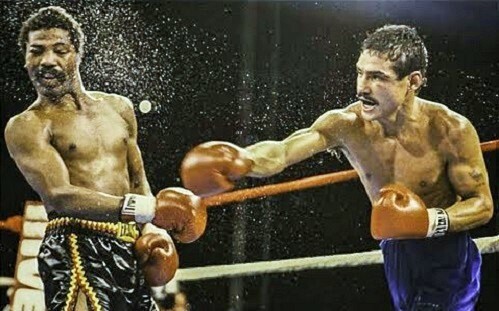 Behind on points and sporting cuts around the eyes, Arguello seized the initiative and began to drive the champion back with his favourite combination, a left hook to the body followed by the right hand upstairs. Rounds 11 and 12 belonged to the challenger and the crowd roared as Pryor appeared to be fading and their hero looked ready to make history. But it was not to be. The gallant triple-crown champion made his last stand in round 13. The crowd exulted as the challenger dug deep with big left hooks to the body and then blasted Pryor with huge rights hands upstairs, one of which hit Pryor so violently it buckled his knees and had him looking straight up to the skylights above. But the determined champion simply refused to go down. 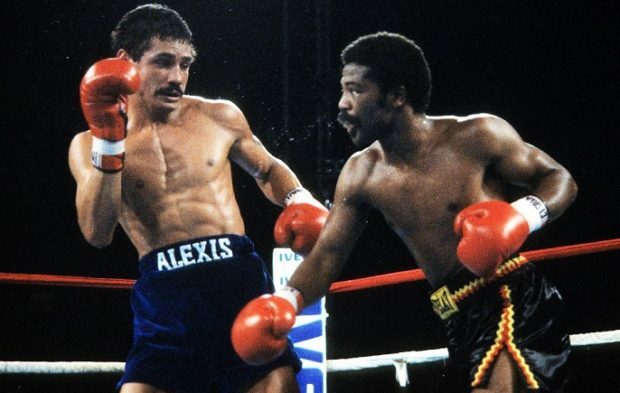 At the end of the round, Alexis must have been asking himself, “What do I have to hit this guy with, a sledgehammer?” And indeed, as round 14 began, Arguello was visibly deflated and fatigued, breathing through his mouth and suddenly there to be hit. “The Hawk” never stopped attacking. Pryor immediately took advantage. He stunned Arguello with a left, staggered him with a right, then softened him up with a series of jabs before smashing home a thunderous right hand that could have caved in a side of the Orange Bowl. Arguello’s whole body buckled and will alone kept him upright as he skittered backwards to the ropes. Pryor pounced and connected with more than a dozen flush power shots before the referee finally jumped in to stop it and Alexis crumbled to the canvas. After 14 furious rounds, Pryor had halted Arguello’s bid for fistic immortality. And yet even this victory, the biggest of his life, the critics and detractors tried to take from Pryor. Before the final round, his trainer, Panama Lewis, later convicted of tampering with a boxer’s gloves and subsequently banned from boxing, had been overheard asking for a special water bottle, “the one [he] mixed,” and in the bout’s aftermath everyone offered up their preferred stimulant as the secret ingredient. 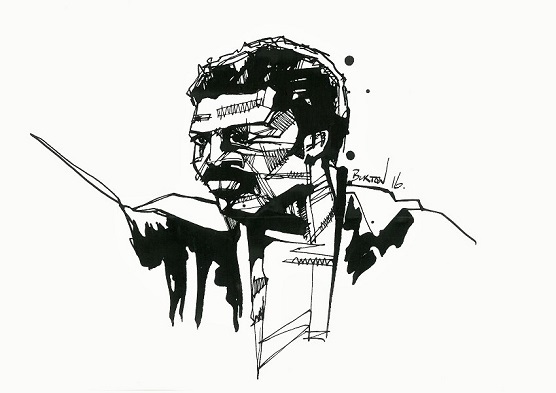 Aaron Pryor: Ink drawing by Damien Burton.